Check back often as events are updated throughout the year. 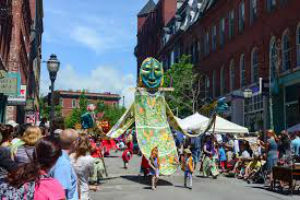 Kick off summer in Maine at the 46th annual Old Port Festival! This family-friendly event is an outdoor celebration of art, music and community in the heart of beautiful Downtown Portland. Come one, come all and enjoy awesome live music, Maine-made arts and crafts, food from local businesses, kids’ activities and more! Kickoff Parade at 11am featuring Shoestring Theater — The parade starts at the top of Exchange Street! A smoke- and tobacco-free environment for the health of all!